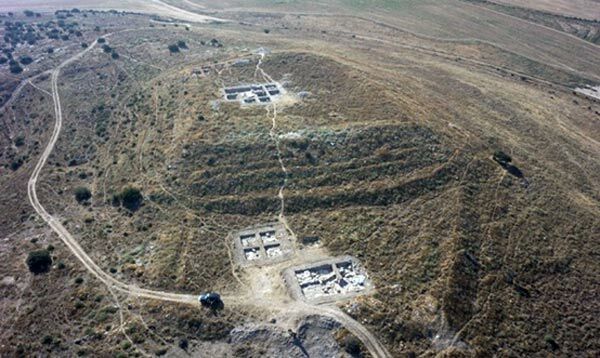 Archaeologists excavating the Tel Burna archaeological site in the Shephelah region of what is now Israel, have unearthed a cult complex dating back around 3,300 years, which may have been used for worshipping Baal, the Canaanite storm god, according to a report in Live Science . The site of Tel Burna was primarily inhabited in the Bronze and Iron Ages, and was one of a series of sites along the border between the kingdoms of Judah and Philistia in the Iron Age. 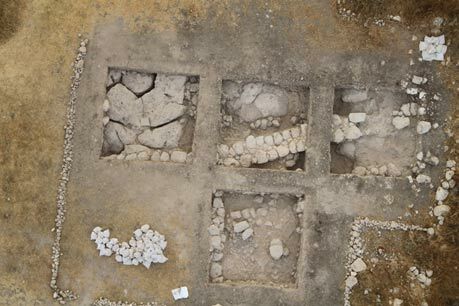 Numerous discoveries have been made since the Tel Burna Excavation Project , headed by archaeologist Dr. Itzick Shai, first began investigating the site in 2010, including fortifications, domestic areas, and numerous silos for grain storage. Now, the research team have uncovered numerous intriguing structures and artifacts that point to the presence of a cult complex used for sacrificial rituals and ceremonies. Aerial view of section B of the excavation site, where archaeologists believe a cult complex once stood. Credit: The Tel Burna Excavation Project . Archaeologists have estimated that the cult complex was large, with a courtyard measuring 52 by 52 feet (16 by 16 metres). Inside the ancient structure, researchers uncovered numerous artifacts that suggest the site was used for religious worship, including fragments of facemasks, which may have been used in cultic ceremonies; giant storage vessels from Cyprus, possibly used as storage for tithes brought to the cultic complex; figurines, some of which look part animal, part human; a scarab, which is an artifact with an Egyptian hieroglyphic inscription on it; three connected cups, currently been analysed for residues; numerous goblets and chalices; and burnt animal bones, which may indicate sacrificial rituals or feasts. 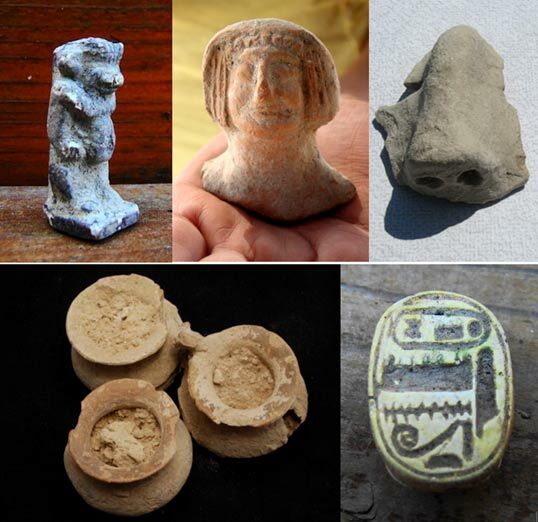 Images from left to right, top to bottom: Bes figurine, the ‘Lady of Burna’ figurine, nose from a mask, unique triplet vessels connected to each other, Egyptian scarab. Credit: The Tel Burna Excavation Project . The archaeologists said that, while more analysis is needed, the complex may have been dedicated to Baal, the Canaanite storm god. "The letters of Ugarit [an ancient site in modern-day Syria] suggest that of the Canaanite pantheon, Baal, the Canaanite storm god, would have been the most likely candidate," Itzhaq Shai told Live Science. The worship of Ba'al in Canaan was bound to the economy of the land which depended on the regularity and adequacy of the rains. Anxiety about the rainfall was a continuing concern of the inhabitants which gave rise to rites to ensure the coming of the rains. Thus the basis of the Ba'al cult was the utter dependence of life on the rains which were regarded as Baal's bounty. That's interesting that they found the scarab with heiroglyphs on it. Awesome article. I always thought Baal was an Egyptian god? Ba'el or Ba'al is also the same as Yahweh/Jehovah. ...but it sounds like you're saying Ba'al, the Canaanite storm god, is also Yahweh/Jehovah. And I'm pretty sure that can't be right. For instance, that whole scene where Elijah challenges Jezebel's priests of Ba'al to a pray-off(first one to get a definitive response wins) to see who's god is more powerful, etc....what would be the sense in Elijah humiliating the cult of Ba'al if Ba'al was his god too? i guess i'm curious about the use of the word cult. when i think of a cult i think of a sect of people on the fringe or those crazies from Heaven's Gate...but if this was the dominate practice of the time, does that still make it a cult? Just because it isn't dominate now?